Yes, that sounds like a special passageway in old Europe. But back here in California our boat’s boarding ladder gives it’s credit to good friend Mike Leneman and his lovely Minette catamaran. After a brisk Wednesday night sail out of Marina Del Rey, Mike simply stated, “yea Greg, you’ll be making one of these”. These steps will swing up and tie off to the beam brace when not in use, and the whole unit will quickly unpin for storage in the float when at sea. The bottom step is one inch above the waterline when the steps are set at level. They can raise or lower to suit conditions. Sailing aboard Minette last year was a real inspiration for this project. 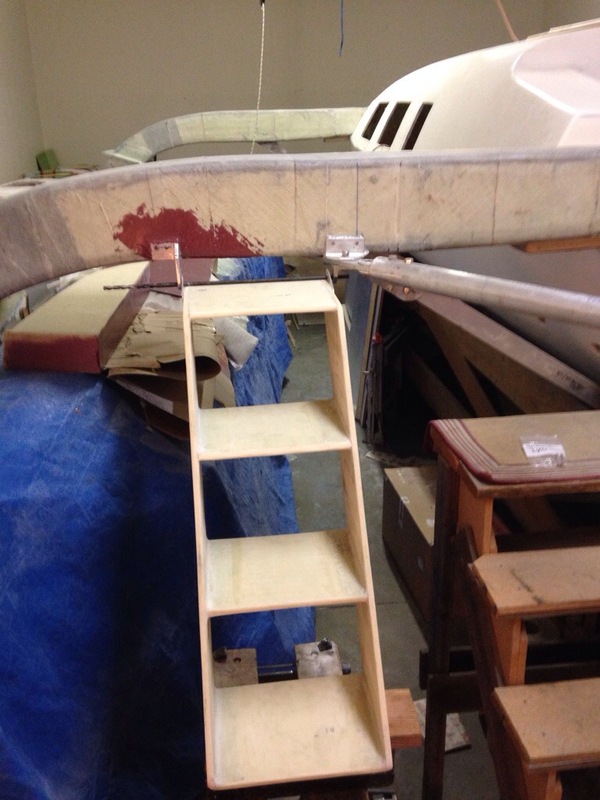 Mike built her with the same cold molding strip plank and glass method, making a strong, light boat out of trailer able large hulls, beams and bridge. Her simple systems and big powerful rotating rig scared Jim and I at first, but the speed and sea keeping abilities really grow on you quickly. It’ll be a thrill to join Mike down south next year. Here’s a clearer shot of the rear diagonal brace behind the aft beam. 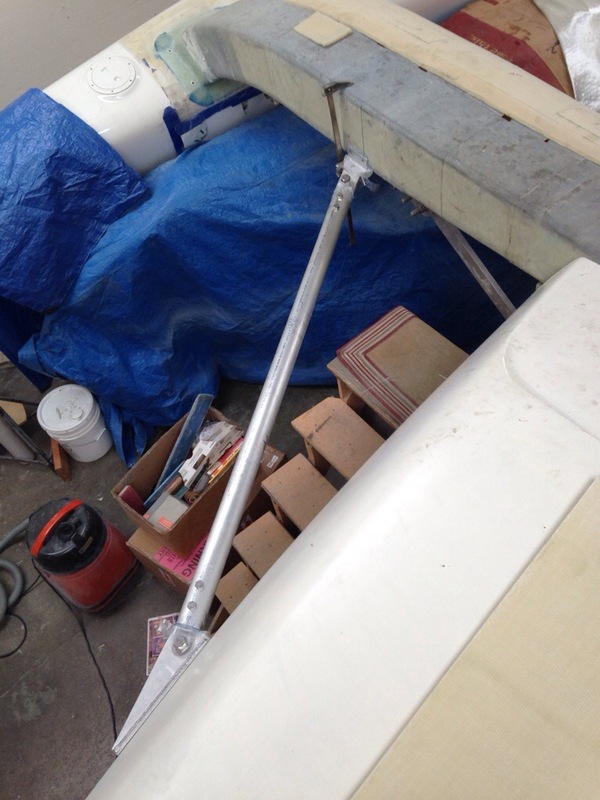 Very sturdy and designed to keep the whole boat square (prevent wracking that can occur in weaker trimaran designs). Thanks again Dad for cutting all the thick metal tangs that I cemented in to this pole. The epoxy goes in 4 inches, stopped by foam plugs at each end. There will be netting placed in this triangle later on. No shop work yesterday as the decks (and minds) were cleared for Jeanne and Greg to enjoy our 25th wedding anniversary day. 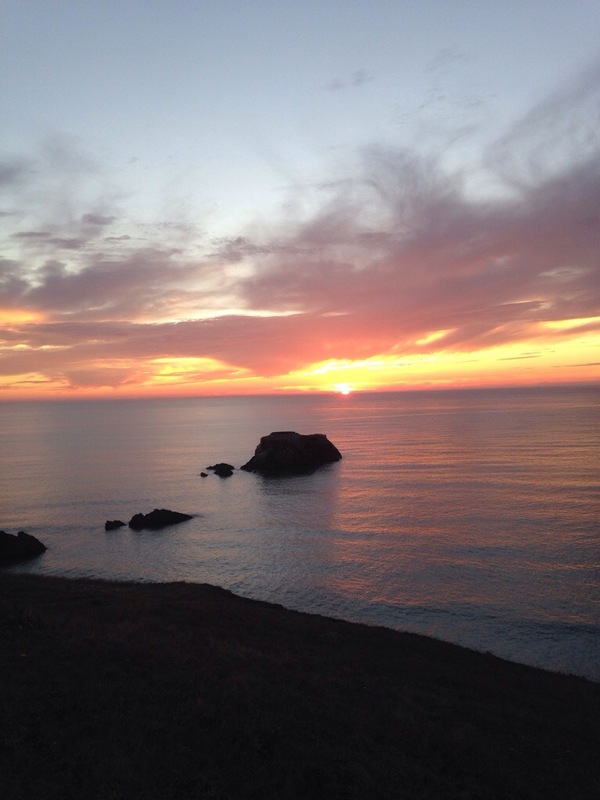 Sunset on the Pacific was perfect.